BROOKLYN HEIGHTS – Ahead of Wednesday night’s BQE Town Hall hosted by the Brooklyn Heights Association (BHA) and A Better Way NYC, Mayor de Blasio announced that a panel of experts has been assembled to evaluate the options for repairing the 1.5-mile, triple-cantilever span of the Brooklyn-Queens Expressway between Atlantic Avenue and Sands Street. The BQE panel will be chaired by Carlo Scissura, President and CEO of the New York Building Congress, and includes leaders in urban planning, engineering, construction, traffic modeling, and historic preservation. The panel will consult elected officials and community groups, and—along with offering its own take on the repairs—will evaluate all alternative proposals. 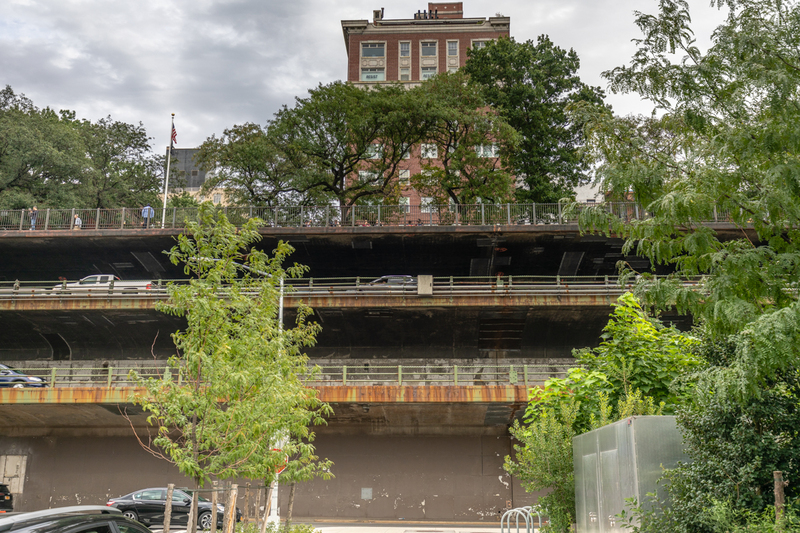 Last September the NYC Department of Transportation (DOT) revealed two proposals for repairing the three-level roadway. The first “traditional” option would have crews working incrementally lane by lane and would take about eight years and cost $3.4 to $4 billion. DOT’s second “innovative” approach calls for demolishing the beloved Brooklyn Heights Promenade and building a temporary six-lane elevated roadway in its place. This approach would take approximately six years and cost $3.2 to $3.6 billion. Brooklyn Heights residents, including BHA and A Better Way, oppose DOT’s first option because of the traffic that will be re-routed onto local streets. They also object to the second option because of the traffic congestion, air pollution, construction noise, and potential damage to nearby buildings it may cause. 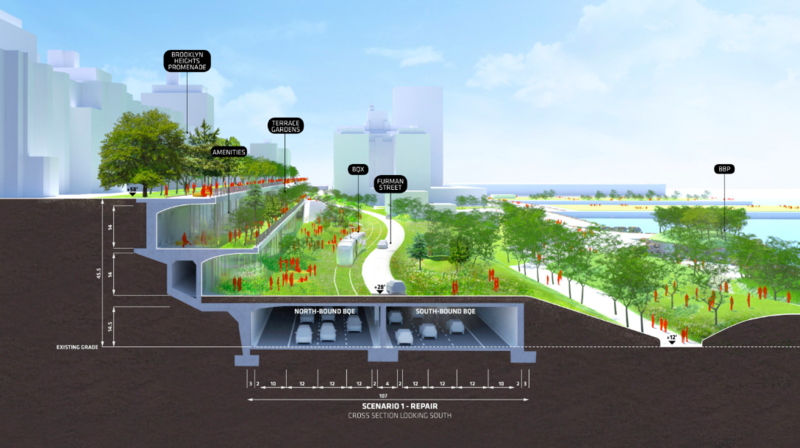 In November BHA presented a plan of its own to DOT which would re-route BQE traffic west to a temporary two-level structure built on Brooklyn Bridge Park’s sound-attenuating berms, leaving the Promenade intact. NYC Comptroller Scott Stringer also proposed an alternative solution in March which includes converting the triple-cantilever section, as well as the trench portion of the BQE that runs along Hicks Street in Cobble Hill and Carroll Gardens, into a trucks-only highway decked over with a two-mile public park. And just before yesterday’s Town Hall, renowned architectural firm (which has an office in DUMBO) Bjarke Ingels Group (BIG), joined the fray, revealing a “better, faster and cheaper” plan for fixing the BQE, the New York Daily News reported. BIG’s proposal, called BQP (Brooklyn-Queens Park), offers two options: the first would transform the triple-cantilever portion into three levels of green space while the second would deconstruct it and “use the rubble to create a sort of cliff-scape,” according to the Daily News. BIG’s overall concept is to construct a new six-lane highway on Furman Street, decking it over and topping it with an elevated park, adding more than 10 acres of green space that would connect Brooklyn Heights to Brooklyn Bridge Park. The deck would extend south to Atlantic Avenue and offer space that could accommodate the mayor’s proposed BQX streetcar. The plan would save the Promenade and allow traffic to continue to travel on the BQE while construction takes place below. Visit big.dk to see BIG’s proposed plan. 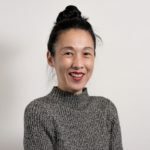 The city-appointed BQE Panel will begin meeting this month and is expected to complete the process by summer, submitting a report that outlines key recommendations including design concepts and construction innovations. The environmental review process for the BQE reconstruction is expected to begin at the end of 2019.